I’ve tried to remember when ketchup chips first came into my life, but it’s a little like trying to remember the first time I wet the bed. I grew up in the 1980s in Canada, a country that takes its wack-job salty snack foods seriously. Few of these are more revered than ketchup chips. For a while in my early teen years you could determine my age from the blood-red rings of ketchup seasoning that permeated deep into my fingers and palms. This is the point where my American friends usually start retching loudly, as if the thought of ketchup-flavored potato chips is somehow too much for their delicate constitutions—too upsetting for a nation of people who’ll happily down a couple Doritos Locos Tacos Supreme, three pints of Coke, and a family pack of Flamin’ Hot Funyuns as a post-breakfast snack. 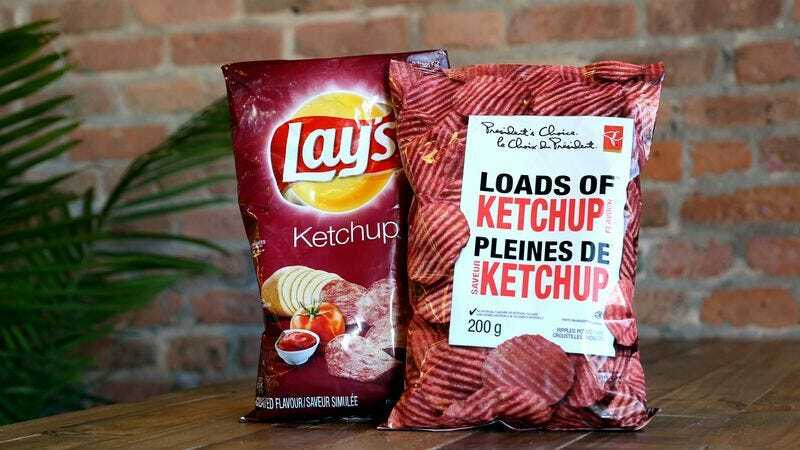 Though ketchup chips are pretty much the most American snack food ever invented, by most accounts their origins, along with their fan base, lie north of the border. Canadians, being Canadians, remind Americans of this at every chance. We want ketchup chips to become a part of you like they’re a part of us. The best ketchup chips are made by Lay’s and sold only in Canada. They’re a masterpiece of MSG-laden zip and crunch. The beauty of Lay’s ketchup chips is that they don’t taste at all like actual ketchup: They taste like ketchup’s component parts, without the wet. You get the slap of vinegar and citric acid, the sweet, synapse-twerking pull of cooked tomatoes and sugar, the crunch of deep-fried potato starch, and all the lip-sticking salt of a Dead Sea skinny dip. Which is to say they’re snack-time solid gold. Most good Canadians can eat a quarter-kilogram bag in a go. Ketchup chips’ history is spotty, but in most tellings, they originated around the Nixon years, out of the labs at Hostess, a made-in-Canada company that had been bought out by General Foods. Hostess was the only chip brand that mattered here, and things were going great until one of the company’s dimmer intellects decided in the 1970s that the world needed fruit-flavored chips. The company rolled out orange, cherry, and grape-flavored varieties. Their failure was crushing and immediate. And so the company doubled down with yet another fruit, the lowly tomato. Ketchup chips were born. America has caught on slowly, of course. Herr Foods Inc., based in Nottingham, Pennsylvania, launched a ketchup chip that’s made some limited inroads, as has Fitchburg, Massachusetts’s Wachusett Potato Chip Company, which was recently bought by Utz. Are they any good? I wouldn’t know, but it’s hard to imagine that the differences between American and Canadian ketchup chips are too profound. I blame their utter lack of market penetration not on taste or quality but on another, simpler factor: Americans have a fear, however misplaced, about the combination of ketchup and potato chips. If you want the real deal, you can find them on Amazon: Canadian-made Lay’s for $13 a bag. Which is steep, I’ll admit, but I’d rather pay $13 for ketchup chips than $4 for Southern Biscuits & Gravy ones. That’s what the U.S. gets as your you-can-only-get-it-here flavor. Listen up. You hear that retching sound?